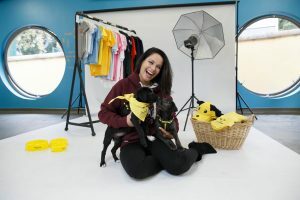 Dogs Trust was delighted to welcome stylist and model Michele McGrath to their Rehoming Centre in Finglas to help launch their brand new online clothing and retail store. The quirky online store features a wide range of casual clothing and goodies designed with dog lovers in mind. The one-stop shop has everything from adults to kids, dog themed apparel and homeware to doggie products, treats and toys for your four legged friends. It even has a personalised products section where you can buy bespoke towels and cushions for your pampered pooch or upload your favourite photo of your pup to print on a canvas frame. All the products have been designed to an extremely high quality and feature clever canine one-liners including: “TheDogfather” “That’s so Fetch!”, “S’UP DOG?”, “Be The Person Your Dog Thinks You Are” and many more dog inspired quotes. Dogs Trust has been working in Ireland since 2005 and its mission is to bring an end to the destruction of stray and abandoned dogs through a national responsible dog ownership campaign, including a subsidised neutering and microchipping campaign and an education programme. There are currently 176 dogs and puppies in Dogs Trust Rehoming Centre, awaiting their forever homes. Dogs Trust is working towards the day when all dogs can enjoy a happy life, free from the threat of unnecessary destruction. Dogs Trust has a non-destruction policy; we never destroy a healthy dog.